Ireland, Jazz, Dublin Zoo, Bloody Sunday and the Athlone Musical Society. Last year marked the hundredth anniversary of the 1916 uprising and, if you’re a jazz fan, you’ll probably be aware that this year sees the hundredth anniversary of the first jazz recording by the Original Dixieland Jass Band (or Original Dixieland Jazz Band as they came to be known) in 1917. Jazz didn’t start in 1917 of course. It’s hard to say it started at any particular time, instead, the music changed over time and at some point, the name jazz stuck. But it’s messy. Jazz meant different things to different people as much in 1917 as it does now. The all-white ODJB weren’t the first jazz band, just the first to record and claim ownership to the name. Critic Kevin Whitehead makes the good point that genre was as intangible then as it is today, and that the journey to the first jazz recording was a gradual one. You can listen to a NPR radio programme that discusses some of his ideas here. So what does any of this have to do with Ireland? Well, early jazz in Ireland has been largely ignored by just about everyone, oftentimes, I think, due to the fact that what it seemed to represent then is difficult to reconcile with how we often understand jazz performance today. As part of my PhD research, I looked into early jazz performance in Ireland, and in particular Dublin, and was surprised by what I found. I intend to write some blog posts about pre-jazz musical history in Ireland at a later date but now I want to focus on what my research indicates was the very first jazz performance in Ireland. For non-Irish readers, a little background in one sentence. Following on from the Easter Rising of 1916, the Irish War of Independence had been fought between 22 January 1919 and 11 July 1921, which was closely followed by the eleven-month Irish Civil War from 1922 to 1923 and the declaration of the Irish Free State on 6 December 1922. In this turmoil, jazz was not a priority for even the most cosmopolitan Dubliner. Jazz was very much a dance music and who had time for that in 1919? Well, to be a little facetious, the British armed service and their visiting friends from the USA armed services may have had time (in fairness, everyone dances during times of strife). The Irish Independent of 15 February 1919 reports that ‘Mr Gordon’s “Jazz Band” of 5 U.S.A. Naval men in uniform’ were the ‘principle attraction’ at the ‘Zoo Ball’ held the previous night in the Royal College of Surgeons. There were three-hundred in attendance (supper was served at midnight) including ‘many officers of the Army, Navy and Air Force’. The vast majority of the column lists the dignitaries present. The December 1918 election had resulted in a landslide victory for the Irish republican party Sinn Féin, whose MPs deliberately abstained from taking their seats in British Parliament. Subsequently, they formed the first Dáil and declared independence from Britain on the 21 January 1919. The War of Independence would not escalate until later that year. Twenty-four days later the British forces were dancing to jazz in the Royal College of Surgeons on St. Stephen’s Green, just a stone’s throw away from the Mansion House, Dawson Street, where the first Dáil had declared independence. Of further relevance to Dublin musical history is that ‘every alternate dance’ was played by Mr. John Clarke-Barry’s band. John Clarke-Barry was the father of Billie Barry who went on to found the Billie Barry Stage School which is still in existence. Clarke-Barry’s band often played in Anglo-Irish circles, (a term that refers to a privileged social class in Ireland whose members were mostly protestant). The Billie Barry Stage School, of course, has no political leanings. In fact, I played at an event for the 50th anniversary of the Billie Barry school in 2014, in the Mansion House, serendipitously becoming a very small part of the story that I was researching at the time. Mr Clarke-Barry had one of the most successful Irish dance bands of the time, but didn’t seem to embrace the changes that jazz was bringing. There was a court case in November 1919 when a retired cadet and a captain from the British army were applying for a licence for music and dancing at 35 Dawson Street. Two ratepayers and the Vigilance Association (a Catholic organisation that primarily focused on the censorship of ‘immoral’ films and literature) had opposed the licence. Counsel for the application stated that in addition to the applicants, two members of the band had also served in the war ‘and the fact that these people fought in the war might account for the bitter opposition to the application’. The war referred to here is what would become known as World War I. Again, for non-Irish readers, although Ireland had been a part of Britain during WWI, many inside Ireland had been fighting for independence for over four hundred years, and the movement had been coming to a head over this time. For many Irish, fighting on the side of the British was seen as a betrayal. The treatment of the Irish who fought in the British army in both world wars is still a subject of debate today. Whether these band members were Irish or British it does not say, and it would not matter, identities were much more complicated then that, then as now. This was not the first time jazz had been viewed as a form of music that was both racialised and sexualised, that had been going on since its appearance and the same charge had been made about ragtime which had preceded it. The following day however, a writer by the pen name of ‘J.H.C.’, declared that ‘the dreaded jazz’ is really ‘[j]ust the one-step, danced double-quick to the same old music with the simple addition of pandemonium effects’. Losing the hysterics for at least one day. It was either good timing or opportunism that only four days after the controversy of the ‘immoral jazz’ in the Irish Independent, Mr Harry Foy of Church Street, Athlone was advertising ‘Mr. Harry Foy’s Jazz Quartette Band’ in the Connacht Tribune. The 1911 census reveals that Henry Foy lived in Church Street, Athlone, was a professor of music and born in Westmeath. At the time of the census Henry ‘Harry’ Foy was 30 and so would have been about 38 in 1919. Mr. Harry Foy’s innovative musical efforts started before this time, as he also co-founded the Athlone Musical Society, Ireland’s oldest musical society, in 1902 at around the age of 21. I find it fascinating how quickly the concept of jazz was taken up, not just for dancers, but by musicians as well. We will probably never know what sort of music Harry Foy was making, nor his reasons for starting what was very probably Ireland’s first jazz band, but it was the beginning of a practice of music making that continues today. That fact that he was advertising his services brings up the connection to economics. Today we like to think of jazz as an art music, and it is, but it has never been disconnected from economics. Furthermore, the case of Harry Foy highlights the ease and speed with which a black music could be appropriated by a completely different culture. The beginning of a relationship between Europeans and black music that has been producing both pleasure and pain ever since. Further early jazz performances in Dublin are recorded in the contemporary press and include the Cocktail Syncopators at the Theatre Royal ‘introducing Singing and Dancing, and their Famous Jazz Band’ on 1 May 1923, the ‘Famous Dixie Minstrels – (Come and hear their Jazbos Band)’, in the Tivoli Theatre in 1925 and ‘Noni and his famous jazz band, the Golden Serenaders’ at the Theatre Royal in 1927. I hope to do a number of these blog posts about the early and not-so-early Irish jazz scene, but most of the information here comes from my PhD thesis which you can download with the link below. Please do comment and get in touch, I’d love to hear your thoughts. 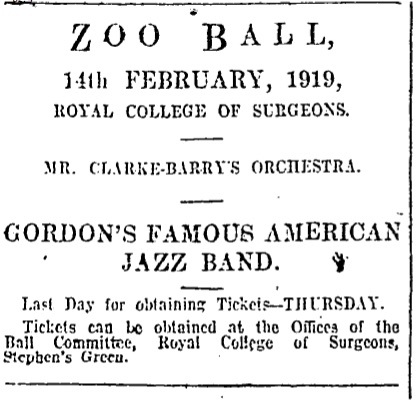 ‘The “Jazz Band” at the Zoo Ball’, Irish Independent, 15 February 1919, 6. ‘Is the Jazz Immoral?’, Irish Independent, 25 November 1919, 5. Cottrell, Peter: The Anglo-Irish War. The Troubles of 1913-1922, (Osprey Publishing, 2006), 53. J.H.C. : ‘To-day & Yesterday’, Irish Independent, 26 November 1919, 4. 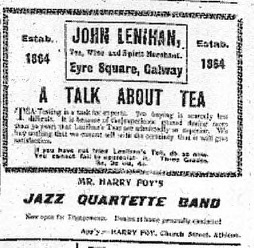 ‘Mr Harry Foy’s Jazz Quartette Band’, Connacht Tribune, 29 November 1919, 8. ‘Westmeath Independent – Pages from the Past’, Westmeath Independent, <http://www.westmeathindependent.ie/news/roundup/articles/2012/02/29/4009279-pages-from-the-past> . ‘Theatre Royal Advertisement Cocktail Syncopators’, Irish Times, 1 May 1923, 4, ‘Dixie Minstrels’, Irish Independent, 4 March 1925, 10, ‘Public Amusements’, Irish Times, 11 March 1927, 6.